The pawpaw is a strange fruit that deserves more attention. Reportedly Thomas Jefferson’s favorite fruit, this North American native is something like a pulpy banana with seeds that sprout up in groves in the wild. But what if you want one in your own backyard? Keep reading to learn more about pawpaw tree reproduction methods and how to propagate a pawpaw at home. The most common and successful way of propagating pawpaws is the harvest and planting of seed. In fact, the harvest step isn’t even entirely necessary, as the entire pawpaw fruit can be planted in the ground the autumn, with very good likelihood that it will put up shoots in the spring. If you do wish to harvest seeds from the fruit, however, it’s important to let the fruit ripen to maturity first, as it tends to drop from the tree while still green. Let the fruit sit in an airy spot until the flesh softens, then remove the seeds. Allow the seeds to dry, scarify them, and then store them in a cold spot for two to three months. Alternatively, you can sow them directly outdoors in late autumn after scarification. Pawpaws can generally be grafted with success using multiple grafting and budding techniques. Take scions in the winter from dormant trees that are 2 to 3 years old and graft them onto other pawpaw rootstocks. 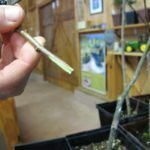 Propagating pawpaw trees through cuttings is possible, but it does not have a particularly high success rate. If you want to attempt it, take softwood cuttings of 6 to 8 inches (15-20 cm.) in late summer. Dip the cuttings in rooting hormone and sink them in rich, moist growing medium. It’s best to take several cuttings, as the success rate of rooting is usually very low.